C Gupta, A Garg, R Uniyal, S Gupta. Comparison Of Antimicrobial Activities Of Clove Oil & Its Extract On Some Food Borne Microbes. The Internet Journal of Microbiology. 2008 Volume 7 Number 1. A study was carried out in the comparative analysis of ethanolic extract (50%) of clove & clove oil as natural antimicrobial agents on some food spoilage bacteria. The antibacterial activity of clove oil & its extract (50% ethanol) was tested against ten bacteria (seven Gram positive & three Gram negative) & seven fungi by agar well diffusion assays. The clove oil was found to be better antagonistic agent as compared to its extract counterpart by inhibiting both bacteria & fungi. The oil was found to be very effective with a lowest minimum inhibitory concentration (MIC) of 2.5% (v/v) against Staphylococcus epidermidis & Staphylococcus sp. Amongst the fungi, Aspergillus niger was found to be highly sensitive to the oil. Sodium propionate (standard food preservative) was used as a positive control. Clove oil was found to be more effective as compared to both clove extract & sodium propionate. This study shows the potential of clove oil to be used as food bio-preservative. The increase of food borne infections has resulted from the consumption of food contaminated with bacteria and/or their toxins. This has initiated considerable research interest towards the discovery of potent antimicrobial agents. Today the issue of food preservation has become more complex, with increasing concern over the presence of chemical residue in foods and the demand for non-toxic natural preservatives is increasing everyday because of harmful effects of food preservatives. The recent negative consumer perception against artificial preservatives, however, has shifted the research effort towards the development of alternatives that consumers perceive as naturals (Shelef, 1984). Antimicrobial properties of herbs and spices have been recognized and used since ancient times for food preservation as well as in medicinal use (Zaika, 1988; Conner, 1993; Dorman, 2000). A renewed interest in ‘natural preservation’ appears to be stimulated by present food safety concerns, growing problems with microbial resistance and rise in the production of minimal processed food joined with ‘green’ image policies of food industries. Cloves (Syzygium aromaticum, syn. Eugenia aromaticum or Eugenia caryophyllata) are the aromatic dried flower buds of a tree in the family Myrtaceae (Srivastava & Malhotra, 1991; Chaieb et al., 2007a). Cloves are used in Ayurveda, Chinese medicine and Western herbalism. Cloves are used as a carminative, to increase hydrochloric acid in the stomach and to improve peristalsis (Phyllis & James, 2000). It is also used in dentistry where the essential oil of clove is used for dental emergencies (Cai & Wu, 1996; Prashar et al., 2006). In addition, the cloves are anti-mutagenic (Miyazawa & Hisama, 2003), anti-inflammatory (Kim et al., 1998), antioxidant (Chaieb et al., 2007b), anti-ulcerogenic (Bae et al., 1998; Li et al., 2005), anti-thrombotic (Srivastava & Malhotra, 1991) and anti-parasitic (Yang et al., 2003). The chief significance of the above study was to carry out the comparative analysis of the antimicrobial activities of clove oil & extract as an alternative to chemical preservatives for improving the shelf life of food products. Materials: All chemicals used were of analytical-reagent grade and obtained from E. Merck (Mumbai, India). Readymade clove oil & clove buds (Syzygium aromaticum) were purchased from local market of Meerut (Uttar Pradesh, India). Dr. C.M Govil, Professor, Botany Department, C.C.S University, Meerut, India confirmed the species. Bacterial and fungal test isolates: Ten bacterial isolates (seven Gram-positive and three Gram-negative), mostly food-borne pathogens, were selected for this study. The Gram-positive bacteria comprised Bacillus cereus, Bacillus subtilis, Bacillus sp., Staphylococcus aureus, Staphylococcus epidermidis, Listeria monocytogenes and Micrococcus luteus, while the Gram-negative bacteria comprised Escherichia coli, Klebsiella sp. and Pseudomonas aeruginosa. The fungal isolates used in this study were Alternaria sp., Aspergillus fumigatus, Aspergillus niger, Aspergillus sp., Penicillium sp., Rhizopus sp. and Rhizomucor sp. The bacterial and fungal cultures were obtained from the Department of Microbiology, C.C.S University. The bacteria and fungi were cultured on nutrient agar medium and Sabouraud’s dextrose agar (SDA) medium (Hi-Media, Mumbai, India), respectively. The agar plates were incubated at 37°C for 24 h (bacteria) and at 28°C for 3days (fungi). The stock on nutrient agar medium (Hi Media, Mumbai, India) was incubated for 24h at 37°C following refrigeration storage at 4°C until required for sensitivity testing. The viability tests for each isolate were carried out by resuscitating the organism in nutrient agar medium. Extraction: The buds of clove (Syzygium aromaticum) was dried and grounded in a milling machine (Inalsa Mixer Grinder) to obtain a fine dry powder. The powder was weighed, using a single pan electronic weighing balance (Ohaus) and the clove extract was obtained by maceration process. The clove powder was soaked in 50% ethanol (1g of powder per 5mL of solvent) in a 250mL Erlenmeyer flask for 48h at room temperature with intermittent shaking. The flasks were closed with cotton plug and aluminium foil. The mixture was centrifuged at 3,500xg for 20min and finally filtered through Whatmann filter paper No.1 (Azoro, 2000). The pellet was discarded and the supernatant was collected and concentrated under reduced pressure in a rotary vacuum evaporator (Buchi) until a semisolid substance was obtained. This was dried inside the crucible under a controlled temperature (45ºC) to obtain solid powder (Jonathan and Fasidi, 2003). The process of extraction was repeated until the weight of 500mg was obtained. The powder was weighed and reconstituted in dimethyl sulfoxide (DMSO). These were stored in the refrigerator at 4ºC for testing antimicrobial sensitivity. Once the extracts were dissolved in pure DMSO, these are also sterilized, and thus, a very costly and time-consuming step of membrane filtration sterilization was omitted (Zgoda and Porter, 2001). The extract was also exposed to UV rays for 24h and checked for sterility by streaking on NAM. Antibacterial assay: The antimicrobial activities of clove extract and oil were determined by agar well diffusion method (Okeke et al., 2001). Briefly, pure isolate of each bacterium was first sub-cultured in nutrient broth at 37ºC for 24h. One hundred microlitres (100µL) of the standardized inoculum (106CFU/mL; 0.5 Mac-Farland) of each test bacterium was spread with the help of sterile spreader on to a sterile Muller-Hinton Agar plate (Hi Media) so as to achieve a confluent growth. The plates were allowed to dry and a sterile cork borer of diameter 6.0mm was used to bore wells in the agar plates. Subsequently, a 50μL volume of the extract and the oil was introduced in triplicate wells into Muller-Hinton Agar plate. Sterile DMSO served as negative control. A positive control in the form of sodium propionate (standard food preservative) was also included in the study. The plates were allowed to stand for atleast 1h for diffusion to take place and then incubated at 37ºC for 24h. The zone of inhibition was recorded to the nearest size in mm (Norrel and Messely, 1997). Antifungal assay: For determining the antifungal activity of the clove extract and oil, the fungal isolates were sub-cultured on SDA at 28ºC for 3 – 4 days. Sterilized Sabouraud’s Dextrose Agar plates were taken and a sterile cork borer (6-mm diameter) was used to bore wells in the agar. A 50µL volume of the extract and oil was introduced into each of the peripheral wells, while a fungal disc was inoculated into the central well. A negative control (sterilized DMSO) was also included in one of the peripheral wells to compare the activity. The plates were then incubated at 28ºC. The evaluations were carried out by means of daily measurement of the colony diameter, starting at 24 h after the experiment began and finishing when two-thirds of the plate surface of the control treatment was covered by the fungus (Fiori et al., 2000). The appearance of zones of inhibition was regarded as positive for the presence of antimicrobial action in the test substance. The results were expressed in terms of the diameter of the inhibition zone: < 9 mm, inactive; 9 – 12 mm, partially active; 13 – 18 mm, active; >18 mm, very active (Junior and Zanil, 2000). Determination of minimum inhibitory concentration (MIC) of the extract and oil: The MIC was defined as the lowest concentration that completely inhibited the growth for 24 h (Thongson et al., 2004). The MIC for the crude extract was determined by the agar well diffusion method. A two-fold serial dilution of the clove oil, extract and sodium propionate was prepared by first reconstituting it in DMSO. It was then diluted in sterile DMSO to achieve a decreasing concentration range of 500 to 62.5 mg/ml. For clove oil, a decreasing concentration range of 10 to 0.625% (v/v) was prepared. A 50 µL volume of each dilution was added aseptically into the wells in Mueller Hinton agar plates that had been inoculated with standardized inoculums (106 CFU/mL) of the test bacteria. The agar plates were incubated at 37°C for 24 h. Sodium propionate only served as positive control. All experiments were performed in triplicate. The same procedure was used for fungi, except that SDA plates were used and the plates were incubated at 28°C. The lowest concentration of clove extract and oil showing a clear zone of inhibition was considered as the MIC. Clove extract was found to be effective against almost all of the food borne microbes. Staphylococcus aureus was found to be the most sensitive to clove extract with an inhibition zone diameter (IZD) of 26mm, followed by Staphylococcus epidermidis (19mm). Bacillus cereus, B. subtilis & Bacillus sp. were also found to be sensitive against clove extract with an IZD of 15, 16 and 17mm respectively. However, Pseudomonas aeruginosa was found to be resistant, as shown in Table 1. Similarly, clove oil also inhibited the growth of almost all test bacteria except P. aeruginosa, it produced the widest zone of inhibition against Bacillus cereus & Bacillus sp. (24 mm). However, the MIC values of clove oil were much better than the clove extract. The values ranged from 2.5 to 10%v/v for clove oil and between 12.5- 100mg/mL for clove extract. 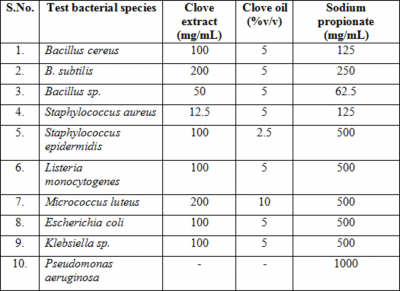 The lowest MIC (2.5% v/v) of clove oil was against Staphylococcus epidermidis and for clove extract the lowest MIC was 12.5mg/mL against Staphylococcus aureus (Table 3). Bacillus sp. was found to be very sensitive to sodium propionate with MIC of 62.5mg/mL. With regard to antifungal activity, the clove extract resulted in the widest IZD against Alternaria sp. (30 mm) and was active against all the test fungal species (Table 2). Similarly, clove oil inhibited the growth of all test fungi. The widest IZD was produced against Aspergillus niger (42 mm) followed by Rhizopus sp. and Penicillium sp. with an IZD of 40 mm each (Table 2). Sodium propionate demonstrated a moderate spectrum of activity against all test fungi. Penicillium sp. was found to be highly sensitive to sodium propionate with an IZD of 32 mm (Table 2). For the fungi, the MIC values of clove extract, oil & sodium propionate exhibited a broad range. Rhizopus sp. and Penicillium sp. was found to be highly sensitive to the clove extract by showing the lowest MIC of 3000mg/mL. For sodium propionate, the MIC values ranged between 500 to 4000mg/mL. Thus sodium propionate was found to be more effective as an antifungal agent compared to clove extract. In contrast, clove oil was active against all test fungi and the MIC values ranged between 2.5 to 10% (v/v), with the lowest MIC of 2.5% (v/v) each against A. niger, Rhizopus sp. and Penicillium sp. as shown in Table 4. The inhibitory activity of clove is due to the presence of several constituents, mainly eugenol, eugenyl acetate, beta-caryophyllene, 2-heptanone (Chaieb et al., 2007b), acetyl- eugenol, alpha-humulene, methyl salicylate, iso-eugenol, methyl-eugenol (Yang et al., 2003), phenyl propanoides, dehydrodieugenol, trans-confireryl aldehyde, biflorin, kaempferol, rhamnocitrin, myricetin, gallic acid, ellagic acid and oleanolic acid (Cai & Wu, 1996). The main constituents of essential oil are phenyl-propanoides such as carvacrol, thymol, eugenol and cinnamaldehyde (Chaieb et al., 2007a). Several studies have demonstrated potent antifungal (Arina & Iqbal, 2002; Giordani et al., 2004; Pawar & Thaker, 2006; Park et al., 2007), antiviral (Chaieb et al., 2007a) and antibacterial effects of clove (Cai & Wu, 1996; Bae et al., 1998; Lopez et al., 2005; Li et al., 2005; Betoni et al., 2006; Fu et al., 2007). The modes of action by which microorganisms are inhibited by essential oil and their chemical compounds seem to involve different mechanisms. It has been hypothesized that the inhibition involves phenolic compounds, because these compounds sensitize the phospholipid bilayer of the microbial cytoplasmic membrane causing increased permeability, unavailability of vital intracellular constituents (Juven et al., 1994) and/or impairment of bacterial enzymes systems (Farag et al., 1989). The components with phenolic structure such as eugenol are highly active against the test microorganisms. Clove oil has 79.2% eugenol (Ranasinghe et al., 2002). Members of this class are known to be either bactericidal or bacteriostatic agents, depending upon the concentration used (Pelczar et al., 1988, Dorman et al., 2000). These compounds were strongly active despite their relatively low capacity to dissolve in water, which is in agreement with published data (Sivropoulou et al., 1996; Hili et al., 1997; Lis-Balchin and Deans 1997). The high activity of the phenolic compounds/ fractions may be further explained in terms of the alkyl substitution into the phenol nucleus, which is known to enhance the antimicrobial activity of phenols (Pelczar et al., 1988, Dorman et al., 2000, Campo et al., 2003). In summary, this study confirms that clove oil possess much better in vitro antibacterial and antifungal activity than its extract and sodium propionate. Hence, it represents an alternative source of natural antimicrobial substances for use in food systems to prevent the growth of food-borne bacteria and extend the shelf-life of the processed food. However, further analysis of clove could be done to isolate the antimicrobial agents present in the spice and to determine their minimal inhibitory concentrations so that they can be used as bio-preservatives in various food stuffs. I would like to place special thanks to Dr C.M Govil, Professor, Department of Botany, C.C.S University, Meerut for helping in identification of the plant. 1. Arina, B. and A. Iqbal. 2002. In vitro fungitoxicity of the essential oil of Syzygium aromaticum. World J. Mocrobiol. Biotech., 18(4): 317-319. 2. Azoro, C., 2000. Antibacterial activity of crude extract of Azadirachita indica on Salmonella typhi, World Journal of Biotechnology, 3:347-351. 3. Bae, E.A., M.J. Han, N.J. Kim and D.H. Kim. 1998. Anti-Helicobacter pylori activity of herbal medicines. Biol. Pharm. Bull., 21(9): 990-992. 4. Betoni, J.E., R.P. Mantovani, L.N. Barbosa, L.C. De-Stasi and F.A. Junior. 2006. Synergism between plant extract and antimicrobial drugs used on Staphylococcus diseases. Mem. Inst. Oswaldo Cruz., 101(4): 387-390. 5. Cai, L. and C.D. Wu. 1996. Compounds from Syzygium aromaticum possessing growth inhibitory activity against oral pathogens. J. Nat. Prod., 59(10): 987-990. 6. Campo, J., Nguyen- The, C., Sergent, M. and Amito, M.J. (2003). Determination of most bioactive phenolic compounds from rosemary against Listeria monocytogenes: influence of concentration, pH and NaCl Journal of Food Science, 68: 2066-2071. 7. Chaieb, K., H. Hajlaoui, T. Zmantar, K.A.B. Nakbi, M. Rouabhia, K. Mahdouani and A. Bakhrouf. 2007a. The chemical composition and biological activity of essential oil, Eugenia cryophyllata (Syzygium aromaticum L. Myrtaceae): a short review. Phytother Res., 21(6): 501-506. 8. Chaieb, K., H. Hajlaoui, T. Zmantar, K.A.B. Nakbi, M. Rouabhia, K. Mahdouani and A. Bakhrouf. 2007a. The chemical composition and biological activity of essential oil, Eugenia cryophyllata (Syzygium aromaticum L. Myrtaceae): a short review. Phytother Res., 21(6): 501-506. 9. Chaieb, K., T. Zmantar, R. Ksouri, H. Hajlaoui, K. Mahdouani, C. Abdelly and A. Bakhrouf. 2007b. Antioxidant properties of essential oil of Eugenia caryophyllata and its antifungal activity against a large number of clinical Candida species. Mycosis, 50(5): 403-406. 10. Conner, D.E. (1993). Naturally occurring compounds In Antimicrobials in Food ed. Davidson, P.M. and Branen, A.L. PP 441-468. New York: Marcel Dekker. 11. Dorman, H.J.D. and Deans, S.G. (2000). Antimicrobial agents from plants: antibacterial activity of plant volatile oils. Journal of Applied Microbiology 88: 308-316. 12. Farag, R.S. et al., (1989). Antioxidant activity of some spice essential oils on linobic acid oxidation in aqueous media. JAOGS; 66:792-799. 13. Fiori, A.C.G., Schwan – Estrada, K.R.F., Stangarlin, J.R., Vida, J.B., Scapim, C.A., Guz, M.E.S., Pascholti, S.F. (2000). Antifungal Activity of Leaf Extracts and Essential Oils of some Medicianal Plants against Didymella bryonial. Journal of Phytopathology 148: 483. 14. Fu, Y., Y. Zu, L. Chen, X. Shi, Z. Wang, S. Sun and T. Efferth. 2007. Antimicrobial activity of clove and rosemary essential oils alone and in combination. Phytother. Res., 21(10): 989-994. 15. Giordani, R., P. Regli, J. Kaloustian, C. Mikail, L. Abou and H. Portugal. 2004. Antifungal effects of various oils against Candida albicans. Potentiation of antifungal action of amphotericin B by essential oil from Thymus vulgaris. Phytother. Res., 18(12): 990-995. 16. Hili, P.; Evans, C.S. and Veness, R.G. (1997). Antimicrobial action of essential oils: the effect of dimethylsulphoxide on the activity of cinnamon oil. Letters in Applied Microbiology, 24: 269-275. 17. Jonathan, S.G. and Fasidi, I.O. (2003). “An Original Article on Antimicrobial activities of two Nigerian Edible macro-fungi Lycoperdon pusilum and Lycoperdon giganteum.” African Journal of Biomedical Research, 6:85-90. 18. Junior, A. and Zanil, C. (2000). Biological Screening of Brazilian medicinal plants. Brazilian Journal of Science 95(3): 367-373. 19. Juven, B. J.; Kanner, J.; Sched, F. and Weisslowicz, H. (1994). Factors that interact with the antibacterial of thyme essential oil and its active constituents. Journal of Applied Microbiology, 76: 626-631. 20. Kim, H.M., E.H. Lee, S.H. Hong, H.J. Song, M.K. Shin, S.H. Kim and T.Y. Shin. 1998. Effect of Syzygium aromaticum extract on immediate hypersensitivity in rats. J. Ethnopharmacol., 60(2): 125-131. 21. Li, Y., C. Xu, Q. Zhang, J.Y. Liu and R.X. Tan. 2005. In vitro anti-Helicobacter pylori action of 30 Chinese herbal medicines used to treat ulcer diseases. J. Ethnopharmacol., 98(6): 329-333. 22. Lis-Balchin, M. and Deans, S.G. (1997). Bioactivity of selected plant essential oils against Listeria monocytogenes. Journal of Applied Microbiology, 82: 759-762. 23. Lopez, P., C. Sanchez, R. Batlle and C. Nerin. 2005. Solid- and Vapor-phase antimicrobial activities of six essential oils: susceptibility of selected food borne bacterial and fungal strains. J. Agric. Food Chem., 53(17): 6939-6946. 24. Miyazawa, M. and M. Hisama. 2003. Antimutagenic activity of phenylpropanoides from clove (Syzygium aromaticum). J. Agric. Food Chem., 51(22): 6413-6422. 25. Norrel, S.A. and Messley, K.E., (1997). “Microbiology Laboratory Manual Principles and Applications.” Prentice Hall, Upper Saddle River. New Jersey. 26. Okeke, M.I., Iroegbu, C.U. ; Eze, E.N. ; Okoli, A.S. and Esimone, C.O. (2001). Evaluation of extracts of the root of Landolphia owerrience for antibacterial activity. Journal of Ethnopharmacology, 78: 119-127. 27. Park, M.J., K.S. Gwak, I. Yang, W.S. Choi, H.J. Jo, W.J. Chang, E.B. Jeung and I.G. Choi. 2007. Antifungal activities of the essential oils in Syzygium aromaticum (L.) Merr. Et Perry and Leptospermum betersonni Bailey and their constituents against various dermatiphytes. J. Microbiol., 45(5): 460-465. 28. Pawar, V.C. and V.S. Thaker. 2006. In vitro efficacy of oils against Aspergillus niger. Mycosis, 49(4): 316-323. 29. Pelczar, M.L. ; Chan, E.C.S. ; Krieg, N.R. (1988). Control of microorganisms, the control of microorganisms by physical agents. In: Microbiology, New York: Mc Graw-Hill International pp. 469-509. 30. Phyllis, B. and B. James. 2000. Prescription for Nutritional Healing, 3rd ed., Avery Publishing, pg. 94. 31. Prashar, A., I.C. Locke and C.S. Evans. 2006. Cytotoxicity of clove (Syzygium aromaticum) oil and its major components to human skin cells. Cell Prolif., 39: 241-248. 32. Ranasinghe, L.; Jayawardena, B. and Abeywickrama, K. (2002). Fungicidal activity of essential oils of Cinnamomum zeylanicum (L.) and Syzygium aromaticum (L.) Merr et L.M. Perry against crown rot and anthracnose pathogens isolated from banana Letters in Applied Microbiology 35: 208-211. 33. Shelef, L.A.; Jyothi, E.K. and Bulgarelli, M. (1984). Effect of sage on growth of enteropathogenic and spoilage bacteria in sage containing broths and foods. Journal of Food Science 737-740, 809. 34. Sivropoulou, A.; Papanikou, E.; Nikolaou, C.; Kokkini, S.; Lanaras, T. and Arsenakis, M. (1996). Antimicrobial and cytotoxic activities of Origanum essential oils. Journal of Agricultural and Food Chemistry 44: 1202-1205. 35. Srivastava, K.C. and N. Malhotra. 1991. Acetyl euginol, a component of oil of cloves (Syzygium aromaticum L.) inhibits aggregation and alters arachidonic acid metabolism in human blood platelets. Prostaglandins Leukot Essent Fatty Acids, 42(1): 73-81. 36. Thongson, C., Davidson, P.M., Mahakarrchanakul, W., Weiss, J. (2004). “Antimicrobial activity of ultrasound – assisted solvent – extracted spices.” Letters in Applied Microbiology 39: 401-406. 37. Yang, Y.C., S.H. Lee, W.J. Lee, D.H. Choi and Y.J. Ahn. 2003. Ovicidal and adulticidal effects of Eugenia cryophyllata bud and leaf oil compounds on Pediculus capitis. J. Agric. Food Chem., 51(17): 4884-4888. 38. Zaika, L.L. (1988). Spices and herbs: Their antimicrobial activity and its determination. Journal of Food Safety 9: 97-118. 39. Zgoda, J.R. and Porter, J.R. (2001). A convenient Microdilution. Method for screening Natural Products against Bacteria and Fungi. Journal of Pharmaceutical Biology. 39(3): 221-225.